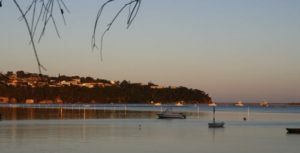 Situated 470kms south of Sydney, 585 east of Melbourne and a mere 247kms south east of Canberra, Merimbula is an easy day’s drive from the three capital cities on the south east coast. 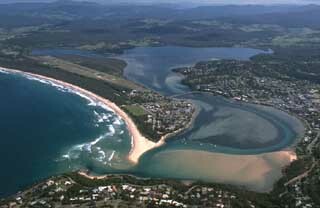 With a population of around 4,000 (and far more in summer) Merimbula is situated around the beautiful Merimbula Lake ajoining the clean, clear waters of the south Pacific Ocean and is the holiday ‘resort’ of the Sapphire Coast. Boating, fishing, swimming, diving and all manner of water sports are popular with tourists and locals alike during the summer months. Golf, bowls, tennis and a wide range of team sports cater for almost every whim for those desiring phsyical activity whilst others settle for a relaxing stroll along the beaches or board walks around the lake. Nearby National Parks provide numerous trails to follow or hidden spots where an afternoon can be whiled away reading or just watching and listening to the abundant birds and wildlife that frequent the area. Three service clubs, a hotel and numerous restaurants and coffee shops cater for the visitors needs after dark. Every June long weekend the town roars to life with the influx of thousands of jazz lovers arriving for the Merimbula Jazz Festival. Begun in 1981 the Festival has grown to be one of the biggest and most popular in Australia with more than a hundred bands playing a wide variety of jazz over the four days.